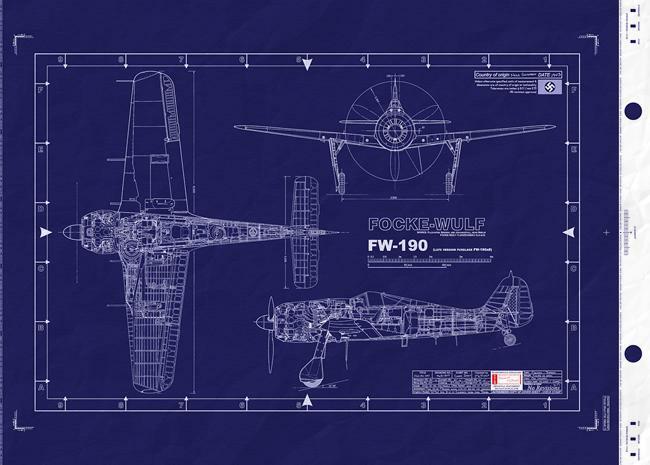 — this was the mysterious new super fighter they'd been hearing so much about… what they didn?t know was just how much of a shock the FW190 had in store for them. 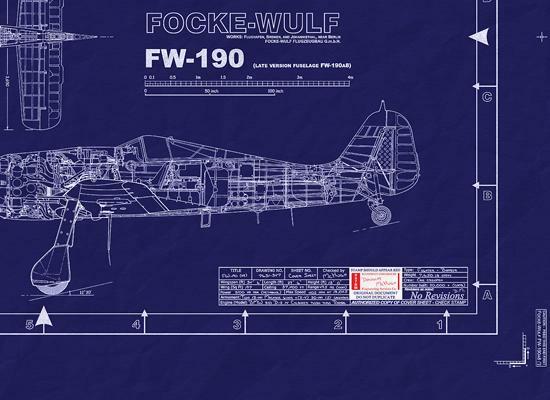 Fw-190 / Factory type - detailed general arrangement blueprint for the Focke Wulf Fw-190. This is a real blueprint; made directly from vellum masters - Measuring a generous 42"x 30". 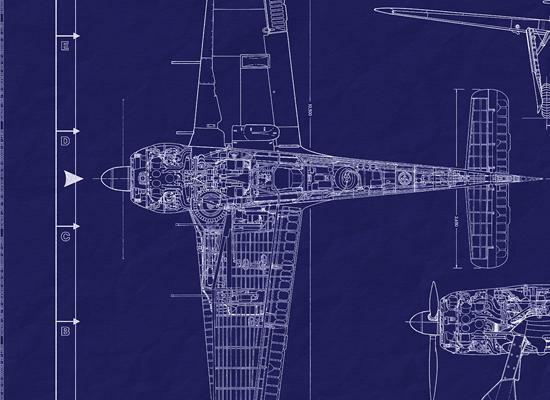 Take a peek and you will see this is not a standard 3-view drawing, but rather a nicely detailed orthographic blueprint revealing the amazing complexity of this war machine. Perhaps my personal aircraft favorite. Also called the "Butcher Bird", it looks powerful and aggressive. A beautiful blueprint. A highly advanced aircraft… given the nickname ‘W?rger’ (Butcher Bird) in deference for its killing ability. 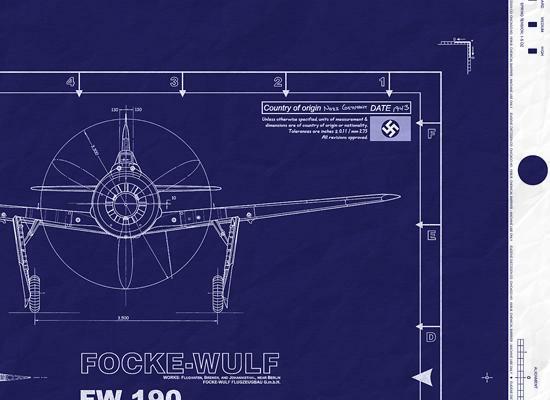 The Focke-Wulf had speed and maneuverability as two of its greatest assets. Plus it?s not overly cluttered with annotations' etc. A must-have for your collection! This one will provide you hours of study as you explore and enjoy the clean lines and construction details. Kurt Tank is credited with designing the best propeller fighter to see service in Germany's Luftwaffe. fighter. It was more than a match for the contemporary Spitfires. Unlike the Messerschmitt Bf-109, the Fw-190 had a landing gear with a wide-stance, making it far more stable during takeoff and landing, especially for less experienced pilots. The bubble canopy provided excellent all-round visibility which not only bettered the Bf 109 but all of the Allies' fighters as well. The air-cooled BMW radial proved reliable and easier to maintain than the Daimler Benz liquid-cooled engines of the Messerschmitt. The Fw-190 began life as a back-up to the Germans' leading fighter, the Messerschmitt Bf 109. By the end of the war it had established itself as the most dependable fighter in the Luftwaffe. It was Germany's first radial-engined monoplane fighter, and flew for the first time in June 1939. The plane was introduced into service gradually; too late for the Battle of Britain, it was first sighted over the United Kingdom in August 1941. In 1943 the Fw-190D entered service. This was powered by the Junkers Jumo 213 inline engine, a change which necessitated several modifications to the airframe. The fuselage was lengthened, and this produced the characteristic 'long nose', and the fin was widened. Extra speed was obtained with the addition of a power boost to the engine, driving the D12 at a maximum speed of 729 kph (453 mph). Increased firepower was allowed for in the 190D 12 and 13, with a 30-mm cannon firing through the airscrew boss. Previous versions of the Fw-190 were armed with two rapid-firing 20-mm cannon mounted near the base of the wings; two slower-firing cannon were positioned midway along the wings. The D model, which enjoyed considerable success on the Eastern Front, was further developed under the designation Ta 152, the prefix being a tribute to the plane's designer, Kurt Tank. Most notable of the Ta 152s were the C model interceptor fighter and the H high-altitude interceptor. These were notably sleeker than their Fwl90 predecessors, but were introduced too late in the war to have a great impact. With nitrous-oxide fuel injection the Ta 152H had a maximum speed of 760 kph (472 mph) and a ceiling of 14,800 m (48,000 ft). The Fw-190F, a ground-attack machine, was armed with 24 50-mm air-to-air missiles or 14 anti-tank missiles; it could alternatively carry bombs. The G version was a fighter-bomber and had a strengthened undercarriage for carrying a bomb-load of up to 1,800 kg (3,967 lbs). Length: 8.84 m (29 ft) Span: 10.51 m (34 ft 6 in) Powerplant: BMW 801 14-cylinder air-cooled radial engine Combat weight: 3,945 kg (8,700 lbs) Max speed: 629 kph (391 mph) Ceiling: 10,600 m (34,775 ft) Armament: four 20-mm cannon: two 7.92-mm MGs Crew: one.